Beautiful Incentives: Petflow Spoiled Rotten Cat Box Review & Giveaway! Petflow Spoiled Rotten Cat Box Review & Giveaway! 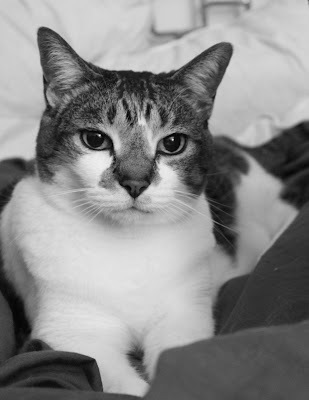 I am always in search of new products for my cat, Lilly. She can be super picky and I have wasted an embarrassing amount on toys for her, that she has either turned her nose up at or uses once and gets bored. Thankfully, a place called Pet flow, my go to for her litter & food necessities, just came out with The Spoiled Rotten Pet boxes! It started out as just for dogs and quickly grew to accompany cats! I was so excited that one of my favorite companies I frequent came up with this and I have nothing but good things to say. Their delivery service has been a godsend and i've never had a problem, so I expected great things. The box costs $24.99 a month with FREE Shipping, and you really do get a bang for your buck at over $40 worth of product. I have seen other pet boxes with far less and the products are really small. These were full size, every single one of them. When I looked up the prices, the cost of everything far outweighed what you pay monthly. This is an excellent deal and they also have coupons every once in a while to get an even better deal. Let's start off with her favorite of the bunch, the lickety stick for cats. They also have one specific to k-9 variety. I cannot really convey to you how obsessed she was with this. I think she'd lick this off my corpse. It was like crack to her. What I love about this is that I can hold this in one hand to deter her from my food in the other. It works perfectly. I am going to need to stock up on these. The lickety stick was simple to use. Just a little shake & squeeze and she licks the flavor off. With every lick the roll moves and brings more treat. I know of some people's pets who were actually scared of this, which made me laugh, because she was timid for maybe about two seconds, before she smelled what was inside! This is the best thing to ever happen to my cat. 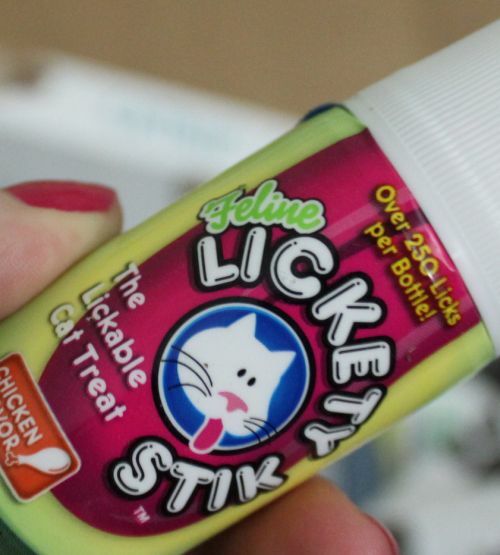 The company guarantees 250 licks per bottle and it's true. I'm pretty sure she got way more than that. 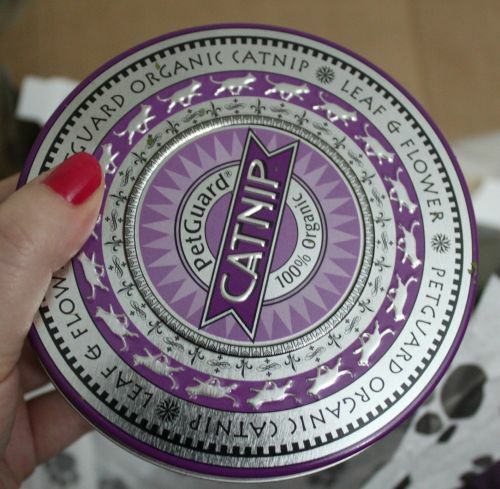 Next up is a Huge tin of Organic Grade catnip. The "good stuff." I love the tin it comes in too. I'll definitely be using it to keep kitty stuff in once it's empty. 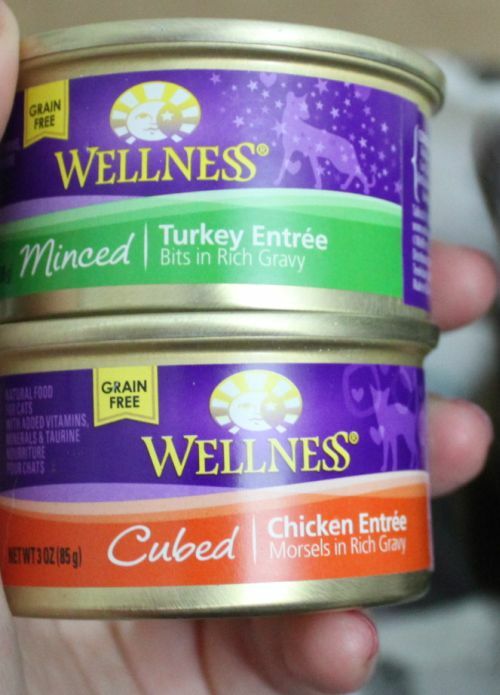 I love that these two wet food samples are grain free. For a while now , I have known that the grains produced for pets are not the quality of ours and most of ours aren't good to begin with. This is why I try to feed her sans grain the best I can. She doesn't feast on wet food much, but this will be a treat to her. I haven't used this on Lilly yet, but I have heard great things. 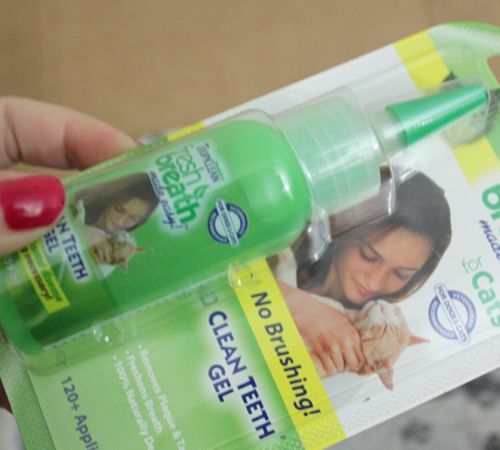 Anything that prevents me having to brush my cats teeth is a good thing. We shall see how she fairs with it. This tooth gel states it has 120 applications so this will last you a long time! 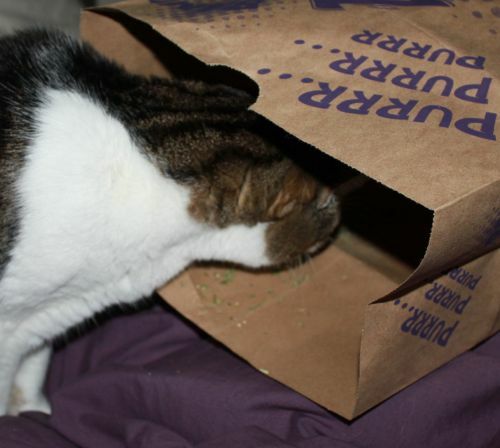 Ok, the Super cat nip cave was well, a paper bag, but it has catnip infused inside. As we all know, cats are obsessed with bags and boxes and these are named right, they are her cave dwellings. The company states that it is toxin free, which is great. I'm always conscious about that. The unique thing about this bag is that it is infused with catnip. I sprinkled some of the "good stuff" inside it and she went right in and relaxed. She didn't scratch at it, but if your cat does, the catnip particles are supposed to come out. She plopped over and fell asleep. About 20 min later, she was pooped from all the unboxing fun. There wasn't one product she didn't like and that is rare and worth the cost of this box. As I stated above, I have long since been a fan of their delivery service for her Litter and food, but now i'm even more impressed. For more info on Pet flow & their Spoiled rotten box, you can follow their Facebook, where they post promotions and funny pet pics all day! And now, i'm excited to offer one lucky person their own Spoiled Rotten pet box of their choice! SUCH a cute post! I'd enter if I had a cat! I am so glad you reviewed the spoiled rotten box subscription. I have been wanting to try this but was really skeptical if it was really worth trying. 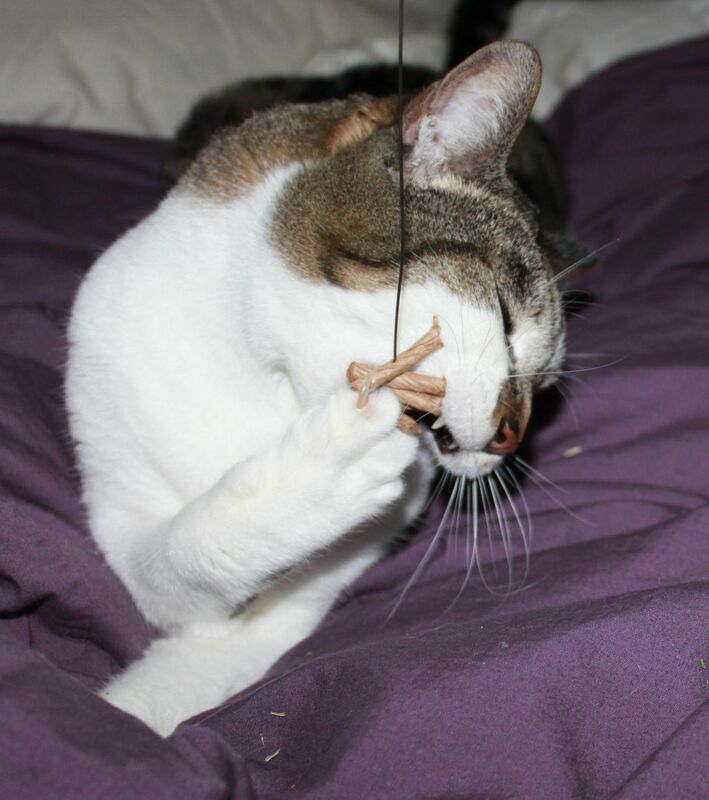 Now thanks to your review I am going to give it a try for both my cats & dogs! Thanks! 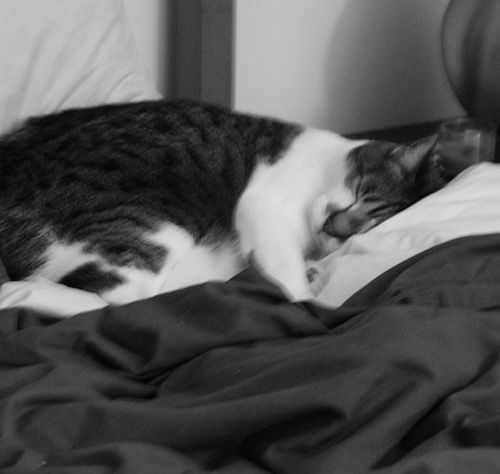 Your cat it so cute! I want one of these for my kitty. Ah, this is so cute and looks like so much fun for our furry friends. Thanks for the review! Aww! Cute kitty! love the review! Love your little kitty! This company is awesome! I love them! beautiful kitty! I love cats, I have several fur babies and would love to spoil them with something like this! Petflow should have already contacted the winner, but I will announce it when I speak to the PR tomorrow :) He is the one who arranged the Rafflecopter for this particular giveaway.